When you have a job that’s beyond the reach of a truck-mounted boom pump, a concrete line pump is often the most affordable and effective alternative. Dynamic Concrete Pumping, Inc. offers an extensive selection of innovative solutions for pumping concrete on residential and commercial projects. Our concrete line pumps provide a small, highly mobile unit you can move around the job site with ease and take deep inside of existing structures where even the longest booms can’t reach. Our truck-mounted concrete line pumps are the ideal solution for medium-rise and high-rise construction projects as well as for industrial warehouses and other jobs that require significantly-sized slabs. With units capable of anywhere from 54 to 209 cubic yards per hour of pumping power, you have the volume and pressure to tackle your most challenging applications while eliminating costly and time-consuming manual labor. We carry a variety of options in concrete line pumps for North American manufacturers with a track record of producing robust and reliable equipment. Our line pumps feature a 19.4 cubic foot hopper and S-Valve design to handle high-volume applications with ease. Free-flow hydraulics serve to reduce pressure peaks and surges delivering smooth, fast and efficient performance every time. 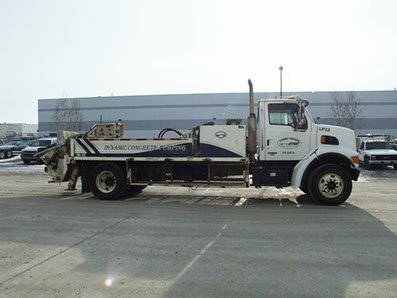 Contact us for more information on our concrete line pump fleet. We offer full-service pumping, pouring and placing and use only the most reliable equipment in the industry.